Even as my own through these. With upward yearning of regret? Of unstilled longing and inspiring pain! I see him stand before me now. Plucks heart’s-ease, and not rue. Friends’ painless tears, the softened thought of foes! What more could Fortune send? Is the mere cheat of sense. And steel each wavering glance. Who weeps not others fair and brave as he? And die as thine have done! 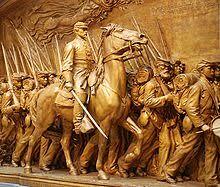 On Memorial Day in 1897 a monument to Shaw and the men of the 54th Massachusetts was unveiled in Boston. It was created by the sculptor Augustus Saint-Gaudens. I have always regarded it as the most striking bit of Civil War statuary, Shaw and his marching men remembered forever in bronze. And so poetry and sculpture are joined in an act of Memoriae Positum to call us to remember the courage of Shaw and his men and to honor what so many of them died for on that long ago July 18th. The movie Glory (1989), a video clip of which begins this post, performs the same function. History serves many tasks, but recalling that which shows humanity at its best, meeting death for a cause deemed just and good is surely in that category, is not the least important and perhaps the most noble. May all of their souls rest in peace.